This year I have tried a mini project-based unit that uses cats to teach genetics. I got the idea for this and some resources from an article written by Alan Christensen, a professor at the University of Nebraska. I started out by running through my normal unit on genetics to serve as a background on genetics vocabulary as well as skills to do Punnett Squares. Next, I had them go into the specifics of cat genetics. Cat genetics are well known due to years of artificial selection. Also, more recently their genome was sequenced and many of the genes that determine hair patterning has been investigated. This entire mini unit was focused on the genetics of cats coat colors. Students were introduced to cats and their genome. I went through a prezi to cover all eighteen autosomes of the cats and highlighted the specific loci where the genes that determined their coat color were located. I covered these observable genes and discussed their forms of inheritance. Then we talked about the Orange gene on the X chromosome. They then were given the chance to look at several cats from a local human shelter and score them for different genes. At the end of class, they were given a chance to look up a specific gene from the NCBI genome of cats and try to determine what these genes does for the cell. (I would like to enrich this part of the unit but I don’t know how.) Their homework was to take a photo of their cat and bring it to school the next day on their phone or in an email. Day 2. Students diagramed their cat based on a photo and posted this along with an analysis of the cat’s genome all around my room. 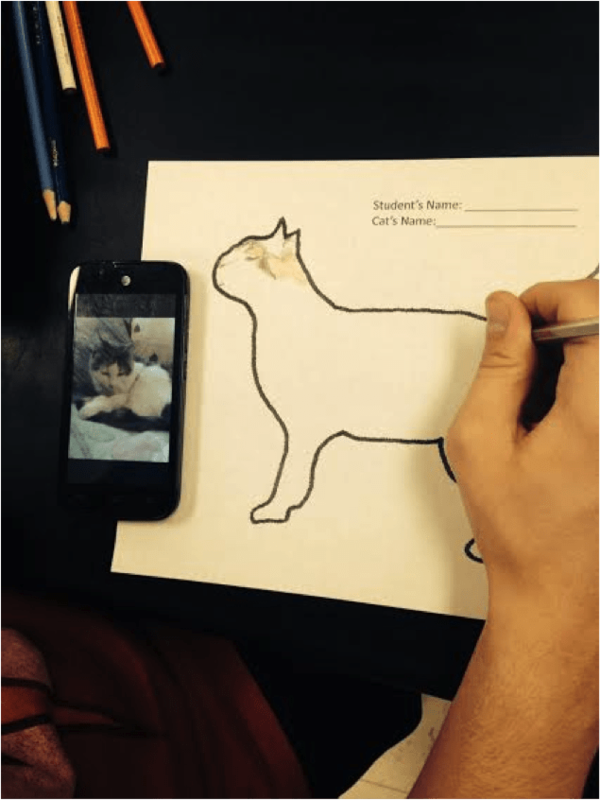 Student using a photo from their phone to diagram a cat. In the future these could be posted to a blog and other students could contribute to the genotyping of each cat. With a simple “cat scan” around the room I began to see some cool trends. For instance, that the dominant White gene was rare in our local population. This turned into a good discussion about why the dominant gene didn’t “dominant” all other genes. After all of our gene pool was posted, I was able to use some manipulatives from my time judging of protein modeling to show how the mutations from different genes can cause changes in color. It was very helpful to have a three dimensional model of a “receptor” protein. I began to ask the question about how one gene such as white or orange could cause a change in color. I’m trying to make Lin Andrews proud here by using some models. I attached them to my board with some magnets. It was so cool looking! I used an explanation from Hopi Hoekstra from the University of Harvard about how fur color can cause a change in color. If the shape of the receptor protein is altered then the function of that protein will change, and in-turn its phenotype will change. Finally, the students read an article about Kermodism in black bears from British Columbia and answered questions about this article. Here is a copy of the article for you to print (Spirit Bear). 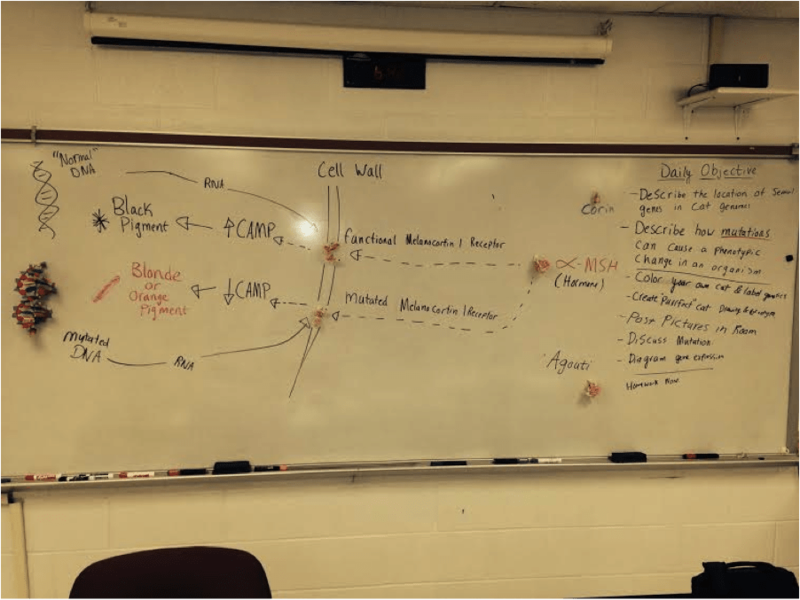 Kermodism is caused by the same Melanocortin 1 Receptor that I diagramed on the board. The students drew a picture of their ideal “purrfect” cat. It had to have realistic traits and it couldn’t be hairless or all white. 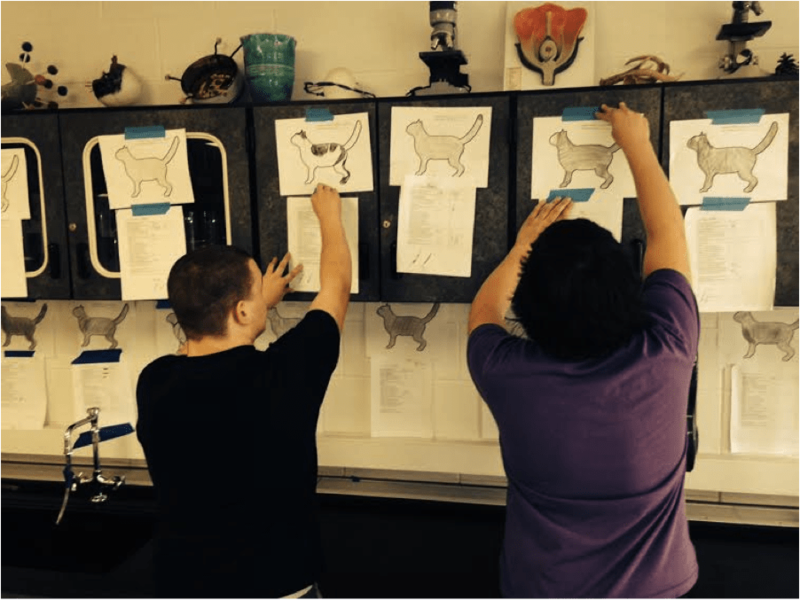 Students were able to take their “purrfect” cat diagrams and set up a breeding program to select from other student’s cats. They imagined that every time two cats bred they would produce eight kittens. I realized that some students were intentionally picking easier cats to breed for. So, I created several imaginary clients who wanted very specific traits for their cats. Each cat that they determined a breeding program for was an additional chocolate bar. Since all of the diagrams were in the classroom I could not ask the student’s to do any homework. In the future it would be neat to take all the pictures and post them to a blog so students could do homework as well as argue over the genes that different cats have. We then concluded the unit with a section on natural selection with a video by HHMI on how mice in the desert have different levels of survival. The mice adapt due to a mutation in their Melanocortin 1 Receptor which is something that the students had heard about in previous lessons. I asked the students to select one single trait from our classes’ cat gene pool. For instance, we only had 5 out of 63 posted cats that were all white. I asked them to write out the percentage of their specific trait. Next, they described a realistic scenario where the environment selected for or against this trait. Several students imagined that there was a second ice age. I got as Socratic as I could with them and made students write out WHY the trait would be selected if an ice age came. Finally, they had to write in what they thought the final percentages of the population would be over time. Thus, I lead them through Variation, Selection, and Adaptation. This will help us lead into our next unit of evolution. One of my students lamented that they had their kitten eaten by a hawk earlier this spring. Another mentioned after class that if I needed a cat skin their family had about 30 cats in their barn… I laughed pretty hard until I realized he was serious. You’ve gotta love it when students start connecting genetics to their little small town. I have just completed the mini unit and I have some mixed feelings as I process and reflect back on it. I think it was a good experience for the students. They were highly engaged in the process (58 out of 63 completed the task of determining the genes of their own cat instead of going online.) and I was glad to see that. The gaping hole in this project is that it needs more authentic artifact or product that the students produce so I can assess their understanding. The most fun part of the process was the number of cat jokes that I was able to work into each lesson. For that alone, it was worth undertaking. Let me know what you think and clue me into any ideas you may have. Agreed, this is an interest alternative to the more common genetics model organisms.